March 21st was Doc's 95th birthday. Unfortunately, he left us shortly after his 82nd birthday. So, to celebrate this monumental birthday, we went up to the cemetery and let go of balloons. 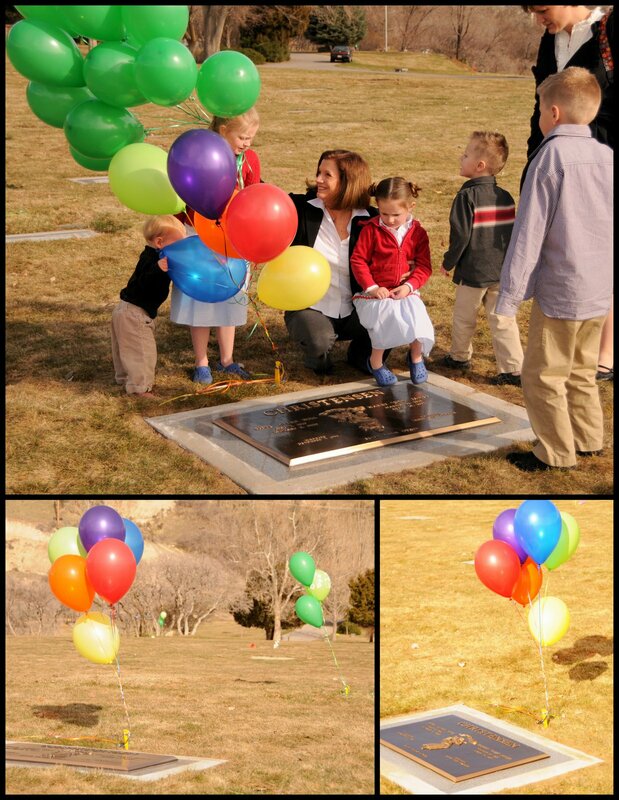 My parents also gave balloons to several of Doc and GG's friends that are buried near by. 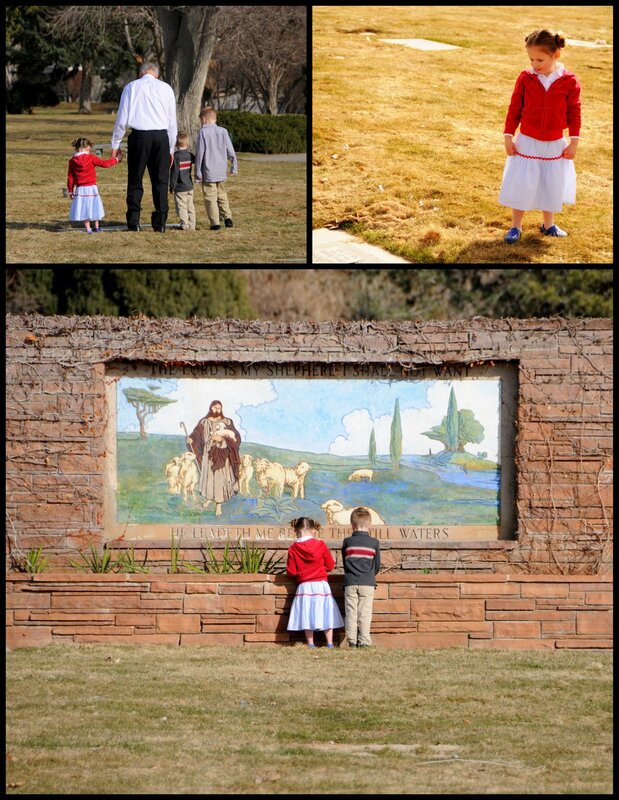 This was the first time that I've been up to the graveside since I married Scott. So, it is also the first time Scott or the girls went up there. Before I met Scott, I spent quite a bit of time up there. I'd sit on a bench near by and read, draw or write. It was my way of feeling close to them. Now, I am able to feel close to them by knowing that whenever they get a break from the very important missionary work they are doing, that they are checking in on us. It was a challenge to help the girls understand that a cemetery is a sacred place: a place where they need to be quiet, peaceful and respectful. What that means to them is "Don't run!" "Don't step on the headstones!" "Don't yell!" We all shared stories of what we remember most about Doc and GG. Since there were only 4 of us that knew them, it was pretty brief. Although there are many many wonderful things I remember about Doc, my favorite is that he was always willing to help. He liked to be asked to help and once he was asked, he'd go above and beyond what you had expected or thought you needed. If you needed to be picked up from school, he'd be there. If you needed to be cheered up, he'd have a game of pinnacle all dealt. If you were hungry he'd make you a huge meal of steak and potatoes. The kids had a great time letting off the balloons and exploring together. Happy Birthday Doc- we sure miss you. I'm so glad you documented this day so beautifully. Although many of our family missed getting to know Doc and Grandma-- I appreciate these opportunities to share memories of them. 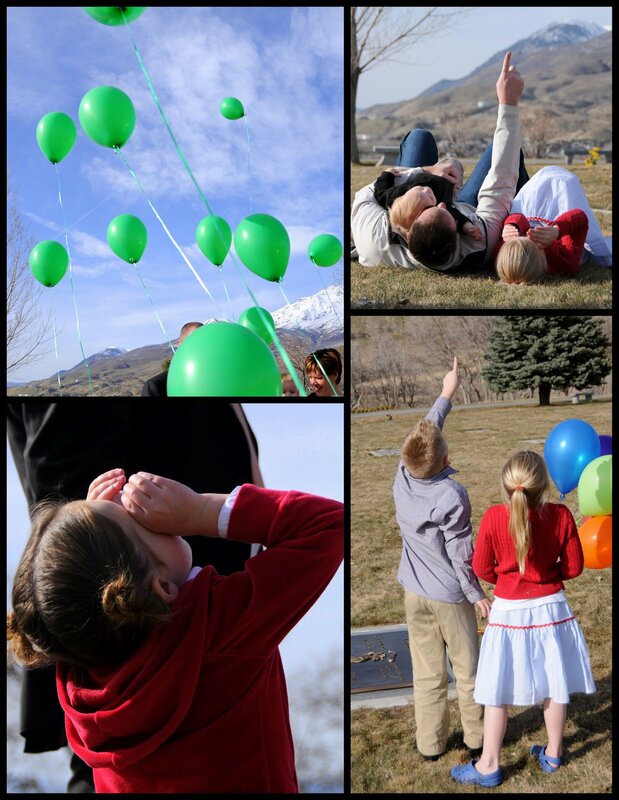 They would have loved getting to know all the additions that have been made to our family.